Fable is a short narrative, in most cases with animal characters and with clear moral. Well, actually it can be much more than that! It is not so easy to define what is a fable, but it is not too hard either. Fables are part of our culture for many centuries and it seems all this time they served the same purpose - to teach a moral. Learning lessons through fables was popular in ancient times in all social classes. It still is. The moral learned with a help of fable is easier to understand and memorized. For your convenience I decided not to answer on: 'What is a fable?' with another lifeless definition. Instead of that I will present 10 characteristics of a fable. 1. Fable is always short. Really short. It is shorter than a fairy tale and shorter than a short story. If we must find a comparison, the best is probably a joke. Like joke a fable is always clear, concise, to the point. And in most cases it is humorous too. 2. Most fables have very simple settings. In typical fable everything happens in one place, right here, right now. This makes fables extremely effective tool for teaching a lesson. With a fable you can make a point very fast. Unfortunately for the same reason lessons learned from fables in most cases don't penetrate very deep into human mind, so they are also easier to forget. 3. Morals are the signature characteristics of fables. Fables were made to teach, instruct, provide a set of rules, not to amuse. One of the oldest known collections of fables comes from India and it is called Panchatantra. Panchatantra stories were supposedly created by wise brahmin who was asked to teach three sons of a king at least something useful (they were spoiled and dull). So brahmin created series of short stories featuring animals with human characteristics. These animals were set in different situations and their actions and reactions are providing examples from real life situations which can be helpful to future kings. This story is very probably only a story (kind of fable, really) and it is great example of frame story serving to connect very different stories into more unified collection (most famous example of framed format of story telling which also includes many fables, is of course Arabian Nights or 1001 Nights). 4. As we can see the moral of the fable is presented through allegory. This means some important, in most cases abstract idea, message or moral, is represented through simple, easy to understand action with simple, one-dimensional characters. 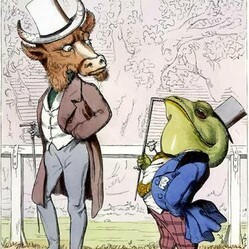 Most popular example of allegories is collection of Aesop's fables, but we can find many more examples in literature (Lord of the Flies is an allegory on human mind and civilization, Narnia series on stories from Bible, Animal Farm on social order in Soviet Union and so on), but also in other media. 5. A fable doesn't have many characters. Two is a perfect number to set a conflict, solve it and present a moral - all in only few lines. We can even find fables with only one character. Fables with more characters use in most cases only two main characters for action and others for the audience. 6. Characters in fables are stereotypical. They don't evolve through the story like characters in fairy tales where is always some kind of transformation included. A character in a fable always represent one characteristic, a human characteristic, which can be associated with the same animal in hundreds of different fables. This is a hand picked list of most famous fables on-line. It is simply the best available resource of more and less popular fables available. I know that, because I made it! 8. As we can notice the word fable is almost inseparable from the name Aesop. Aesop is the man who is credited for the most famous collection of fables in the West. We actually don't know when and where Aesop lived. We also don't know if he is author of any of the fables in Aesop's Fables collection. But we do know his fables inspired hundreds of authors all over the world and thanks to Aesop's Fables we got many great collections with original view on the world. 9. Fables proved to be a powerful tool in our history. If we can believe the legend about Aesop he used fables to mock the authorities and teach them what is right and what is wrong. We have already mentioned Panchatantra was designed to instruct princes and we can add large part of Arabian Nights was written to instruct merchants. 10. Let's end our list of characteristics of the fables with one more important feature of the fable. It is actually pretty realistic. We can't expect magic in fables. We can't expect major transformations like in fairy tales where everything is possible. A fable is written more to show us the world as is not as it should be. There are no subversive revolutionary messages in fables. But fables still have their place in literature for children. To teach and to console. Do you prefer fables, fairy tales or short stories? Do you believe fables can still be useful in today's education system? Well said, fables are educational AND fun! Fables can teach students how to live their lives. I believe fables tell students what is right and what is wrong, but otherwise, they're fun to read although the purpose of their existence is to teach the reader. Thanks, WriterArtist, I find them particularly useful when I want to write something with already known ending or for nice exercise where I am looking for an unsuspected twist at already known story. Fables have always been thee source of inspiration to me as a kid. I remember all the stories from Aesop's fables, they had a morale in each of them. Absolutely, they engage us to a part of ourselves that gets lost in reality. The most colorful way of learning I have ever known. Fables are lifeblood to me. I agree, we should stop racing for a while and take a moment to absorb some wisdom from others (books with fables and fairy tales are certainly on this list). If fables survived hundreds, even thousands years, they should be worth something! Fables should be a part of today's education system. In fact, I think most adults need a reminder on these fables. I remember reading Aesop's fables and the Panchtantra stories and I think they give valuable lessons for living a successful, happy as well as a moral life even today. Facing a problem? Go back to these fables. You will probably get some inspiration there. Thanks for the lovely article! Hi Participated in your poll but I clicked the wrong button. Meant to click "Love all of them!". My bad!